Until recently our dining table barely got used for the right reason. In fact, the dining room was nothing but a thoroughfare to the living room. Occasionally I would decide that I needed my computer downstairs to work (I have a desktop not a laptop - a conscious decision that I made, and one I've pretty much regretted ever since), and then the dining room would start to resemble my studio - an unruly mess, which drove me mad, so I'd take the computer back upstairs again. At other times it would remain clear for approximately two minutes before it got covered in piles of paperwork, post, clean washing waiting to be put away, random bits and pieces belonging to each member of the family and so on. It became the 'in limbo' table. A table for stuff going places, but rarely a table for eating at. We have a kitchen table too. It's small but perfectly formed and great for two people to sit at eating breakfast, but a little bit squashed for four. Yet we'd been squeezing around it more often than using the much larger dining table. Total madness! Over the last few months, I've been making a slow but concerted and determined effort to rid the house of excess clutter. First I'm working on visible clutter which I've nearly achieved with the exception of the studio, and once I've done the studio I want to start working on the dreaded hidden clutter, of which there is LOADS. You know, the stuff shoved into every cupboard including the kitchen cupboards. One of my kitchen cupboards is actually dangerous, and should have a warning on it stating that there is danger of falling organic gluten-free flour. My aim is to at least HALVE the contents of each and every cupboard and wardrobe in the house. Believe me, it's going to be a long and ongoing project. And then there's the cellar. Anyway, having achieved part of of my de-clutter plan at least downstairs, has meant the dining table is clear pretty much all the time. It still gets a little out of hand sometimes, because you know, I'm human, but it's easier to deal with, and things have a place to go. This makes me deliriously and tragically happy. Having the bench seats at the table meant that suddenly the room felt more casual and welcoming - the table beckons to be sat at. And sit we do! Before I would never have sat at that table alone, but now, I sit there several times a day. We eat all our meals there, and I even sit there to read a magazine with a cup of tea. This never happened before, and it's all due to the magic of the bench seats. The trick is to go for backless benches, (unless said bench seat will be against a wall, then by all means there are plenty of gorgeous bench seats around with backs too, but I can't promise they'll be magic) which not only removes the physical 'barrier', also making it so much easier for small kids to climb up onto, but psychologically there's a shift. Maybe that's why communal tables at cafes are often flagged by bench seats, I don't know, but I'm sure there's some research somewhere that would prove that bench seats are more enticing to sit on. My research definitely tells me to keep it this way. 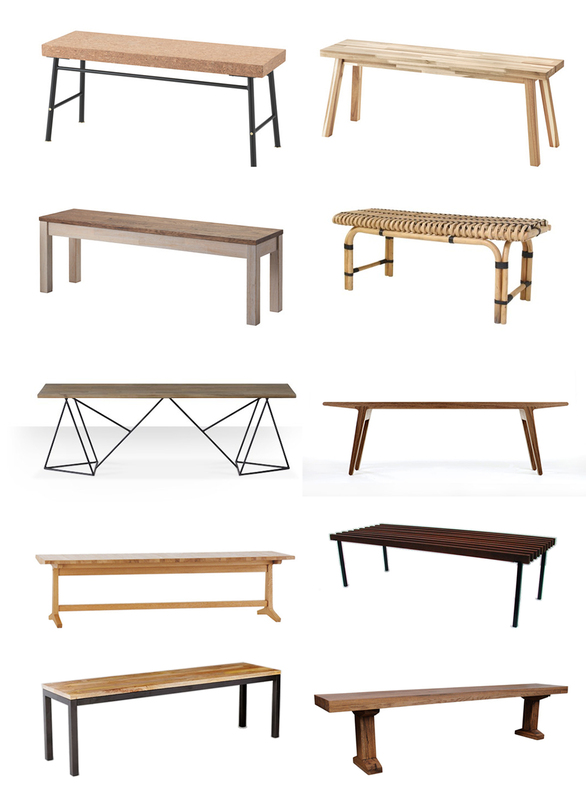 I'm not in the market for another one as we already have two, but there are some lovely benches out there if you decide to go that way, and here ten that would work perfectly. Don't forget to add a sheepskin (or five) to them to make them extra cosy and inviting. Real skins also have natural grip so they don't easily slip off. Perfect! Don't forget to sign up over there on the right so you don't miss a post! I'm now offering a range of interior design services. Get in touch if you need my help, be it choosing paint colours, help choosing art, a whole new room (or house) scheme, and everything in between. I don't bite. Promise.